Your username is your @uregina.ca username - the same one you use to login to URCourses. Your initial password is the first 8 digits of your student ID. Your normal CS password will work and is probably a good choice. Your Mac Lab account comes with 4GB of networked storage on mcserver.cs.uregina.ca. Your homefolder is stored there. Any custom desktop settings you make will follow you from computer to compter in the lab. Any files you save to your personal folders, including the Desktop, will also follow you. Any very large files that you will be working with intensely should not be stored on the network, but should be stored on the local computer (see Local Storage). Each machine has several gigabytes of available space on the hard drive. You can store files in the folder called /XDATA. Note that Mac OS X is based on BSD Unix and uses Unix file system conventions. Any files you store on the local machine will only be available on that machine. If you plan to use them on another machine, copy them to a USB drive or your network account. File permissions on files stored in /XDATA are too permissive - all files are world readable. See the section on Finder/File Management to learn how to secure your data. Dock: used for launching programs and organizing frequently used items. Desktop: used for storing stuff. NOT generally used for shortcuts to applications. Mac Menu: Log out, System restart and lock screen are here. You can also find information about your Mac. Has a permanent link to the Preferences panel, just in case you accidentally delete it from the dock. Application Menu Bar: One application, called the front application, is active for user interaction at a time. This applications main menu is displayed here. Utilities area: You will find controls for Sophos Antivirus, a clock, display settings and volume here, just like the system tray or notification area on the Windows taskbar. Spotlight: The coolest tool in the utilities area. Helps you find what you need. Just click it and start typing the name of a file or application and watch the results pile in. Click on the best match. Use Spotlight if you are lazy like me or if you can't find a program or file where you expect it to be. Spotlight is awesome! The concept should be familiar to Windows 7 users who have a similar feature in their Start menu. A light colored dot under a program's icon in the dock indicates that the program is running. There's usually only one command menu in Mac OS X. It is at the top of the screen and it is controlled by the active program. Some crossplatform software, such as MATLAB, breaks this rule. You can switch between active programs by clicking their icon in the dock, clicking a window that belongs to that program, or by using Command-Tab. That key sequence may seem similar to the Windows Alt-Tab that switches windows, but it is different. It switches Applications. If an application has no windows, or they are all minimized you will switch to it and the only indicator will be the menu bar. If an application has multiple windows and they are not all minimized, you will only switch to the last one you used. Windows have three buttons in the upper left corner. The red one closes the window, the yellow one minimizes the window, and the green one "zooms" the window. The meaning of "zoom" depends on the program. In iTunes it switches between player and music manager modes. In Safari it selects a window width and height that is large enough to optimally display the current page. In Firefox it maximizes the window as a Windows user would expect. Right-click on a program and select quit. If you would like more information about the Mac Environment, including customizations, click here. "Arduino is an open-source electronics prototyping platform based on flexible, easy-to-use hardware and software. It's intended for artists, designers, hobbyists, and anyone interested in creating interactive objects or environments". (from http://arduino.cc/en/). Arduino can use sensors ( for instance, temperature, tilt, and light) to test the environment and can control lights, motors, sound, and more. In later labs, you will get an opportunity to try out these things. In lab one, you need to know the environment that you will be writing the code and a little about the hardware. The remainder of section 2 will discuss the environment. The hardware and the details of the code will be discussed in two subsequent sections. The Arduino IDE will now start running. The following diagram demonstrates what the Arduino IDE looks like. Input Area - this is where you will type or edit code. Status Bar - this is where you get information about the status of your code. For instance, "Done compiling." or "Done uploading." are two messages that appear in the Status Bar. Program Notification Area - this is where you get additional details about the status of your code. Pay attention to this area if you notice that compiling or uploading are not working. Usually there will be some reason why. At this point, you should plug your Arduino devices into the USB Port for the Mac. And now, for the moment that you have been waiting for, let us see something happening. Under the File menu, choose: Examples > Basics > Blink. As shown in the diagram below. A new window will open with code in the input area. You now have your first sketch, which is a special name that Arduino uses to mean a program, or a unit of code that will be run on the Arduino board (hardware). We will be looking at that code more later. You will notice a message "Compiling..." and then "Done compiling." on the bottom of the Arduino window. a message of "Uploading to I/O Board.." and then "Done uploading." on the bottom of the Arduino window. TX and RX lights will blink when the uploading occurs. You should now notice a light (labelled "L") blinking on your board. Congratulations, you have gotten your first sketch running on the Arduino board! 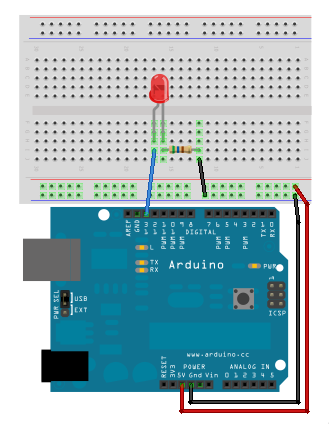 The below diagram (modified from http://arduino.cc/en/Main/ArduinoBoardUno) illustrates where to look for the lights mentioned above. The TX and RX lights flash when data is being transmitted to or from the computer (using the USB connection). L is a special built-in light that is connected to pin 13. When the pin is a HIGH value, the light is on, when the pin is LOW, it's off. This might not mean anything right now, but you will notice that L blinks on and off after you have uploaded the code. So, you have a light blinking, but it isn't that spectacular. The next section will give you the details of how to add your own light and make it blink. Every circuit was "wired" to do one specific application, and making changes required you to cut wires, solder connections, and more. With the appearance of digital technologies and microprocessors, these functions, which were once implemented with wires, were replaced by sofware programs. Software is easier to modify than hardware. With a few keypresses, you can radically change the logic of a device and try two or three versions in the same amount of time that it would take you to solder a couple of resistors. So, we don't have to solder things together. We will temporarily build our circuits on a breadboards and change the code to modify how the device responds. The key to building tempory circuits is a solderless breadboard. 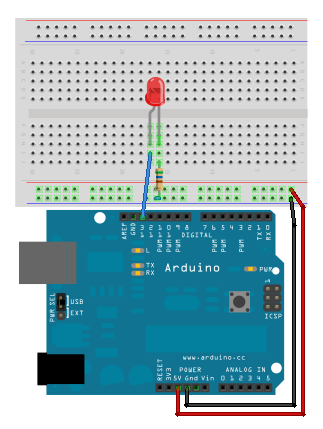 The following diagram (modified from page 94 of Getting Started with Arduino) depicts what the breadboard looks like inside. The thing to note is that there are strips of metal connecting the rows and columns together. Each hole has a spring loaded contact underneath so that when you poke a wire into the hole, a clip grabs onto it. rails- (shown in red on the diagram above) connecting the 25 column holes. Notice that on your own breadboard, the rails are between the solid pair of red and blue lines. 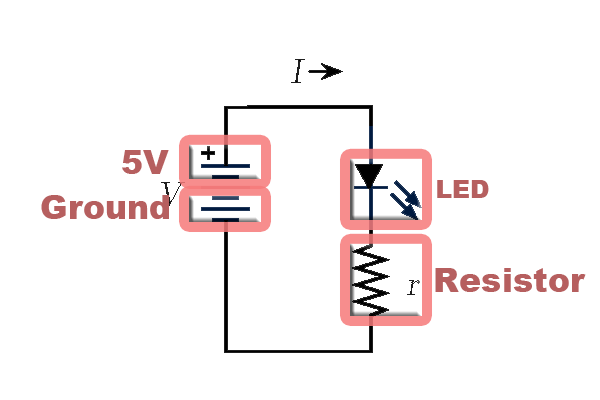 Typically the + column will be connected to the power and the - column will be connected to the ground. bars- (shown in blue on the diagram above) connecting 5 holes at a time in the direction of the letters. Notice that there is a gap in the middle. 5V is for power. Try to use a red wire to connect to this pin. If you follow this convention, it will be easier to figure out where wires are going to or coming from. GND is for ground. Notice that there are two ground pins; it does not matter which one you use. To follow convention, try to use a black wire to connect to this pin. A0 to A5 are "Analog In" pins. Compared to binary input, which is either HIGH (pulled to +5 volts) or LOW (pulled to ground), the values are between 0 (for 0 volts) and 1024 (for 5 volts). 0 to 13 are Digital I/O Pins. Each of these can used as an input or an output. You will notice that pins: 3, 5, 6, 9, 10, and 11 have a tilde (~) beside them representing PWM (Pulse Width Modulation). What this means for you is that you can output in the range of 0 (~0V) to 255 (~5V) instead of just outputing HIGH or LOW. As discussed in class, we can put the resistor on the other side of the light and we will still get the same results. Now, it's your turn to build this circuit. Make sure that the long lead of the LED connects to positive (pin 13). Under the File menu, choose: Examples > Basics > Blink. Your light should now start blinking. If it doesn't, try reversing the light. Remember that the longer lead of an LED connects to positive. You may notice that many of the lines have a semi-colon (;). Semi-colons are the way of indicating the end of a statement; similar to how we use a period (.) to end our statements. The semi-colon is important--if you forget one, then your code will not Compile/Verify. Comments are like reminder notes of what is going on in the code. 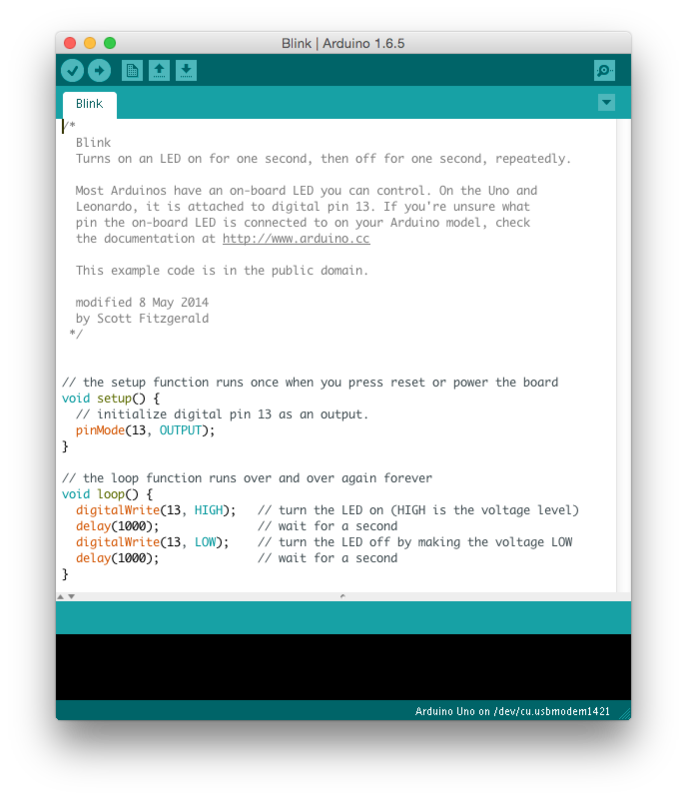 Comments are ignored by Arduino, but are a highly recommended addition to your code. Comments remind you what you have done and make it easier for someone else to know what your code is doing. /* */ - Anything that is between the opening slash-star (/*) and the closing star-slash (*/) is ignored by Arduino. These are good for comments that go over several lines. // - Anything after the double-slash (//) is ignored by Arduino. These are good for short little reminders at the end of a line. We can change the above code to have a variable called ledPin. Notice how instead of using 13 everywhere, you now use ledPin. Why would we want to do that? is a declaration to say "that we would like to create a box named ledPin and put the number 13 in that box." (http://www.ladyada.net/learn/arduino/lesson2.html). Notice that int indicates that the type of box is an integer. After the declaration, you use ledPin where you had 13 before. Try: Adding the variable, then change the 13 to a 9. What else do you have to change in order to get your light to blink? setup()- any statements in this procedure will be executed once at the beginning of your program (when it is uploaded or when the Arduino wakes up after being reset). loop()- any statements in this procedure will be executed over and over again forever, or at least until you turn your Arduino off or upload something new. The statements in this procedure are the core of what you want your Arduino program to do. We will look at the statements within these two procedures in detail in the next two subsections. This statement tells Arduino to "setup" the ledPin (originally pin 13) as an OUTPUT pin. OUTPUT means that a voltage will be sent out from the pin, thus controlling our LED. The other option (not used in this lab) is INPUT, which means that a voltage will be read from the pin. writes HIGH (pulled to +5V) to the ledPin (originally, pin 13). the pin that we are writing to must be configured as OUTPUT (as was done in the setup() procedure). effectively turns the LED on. waits for the specified number of milliseconds before continuing on to the next line. Well, you now know how to make a light blink. What can we do with a blinky light? How about making a message with Morse Code? You have the choice of making SOS or the initials of your name. The code for the Morse code message. Include comments to indicate the beginning of each letter.